The fall time of year brings out the football fans. Tailgating is a very popular activity for those going to the games. Having one of these college logo fire pits to cook your brats on and having a cold one with your friends before the game comes on is what keeps the group together. The time of the year is here for your tailgating at your favorite college football game. 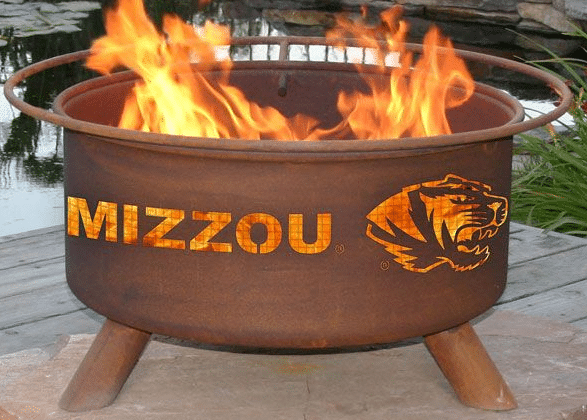 When you tailgate at the game or at your home, you will want a collegiate fire pit from your favorite university, mine is the Missouri Tigers. 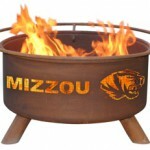 Most major college teams will have a fire pit design and you will want to add one to your football tailgating gear. These fire pits are 30″ around and feature a bow that is 12″ deep and 24″ in diameter. It will come with a protective spark screen that will make it 16″ tall. It has a safety ring around it to keep you from getting burned if you happen to get close to it. No assembly will be required as the fire pit will be ready to use. All you will need to add is wood and a match. Your fire pit will come with a poker, spark screen and weather cover. Your pit will be made of cold rolled steel in a patina color. The name and logo for your school will be on the side. The name is cutout of the side and will glow during those evening tailgate parties. You can burn charcoal or wood in this fire pit. The grate for cooking your food is supported by tabs on the inside of the burn pit. It is supported by three legs that are welded on. These fire pits will be under $230 for your tailgating fun, use this link for more information on your team. You can use it year round to show your support of your favorite team. Log Caddy with black cover-this caddy will keep a small amount of wood off the ground and dry. With the two wheels, it will be easy to move to the location of your fire pit so you will not have to carry wood during your party. Heavy duty log grabber-This grabber is 36″ long and weighs 2 lbs. It is made of steel and can grab a log 8″ around. It had a rubber handle to help keep it secure in your hands it all weather conditions. 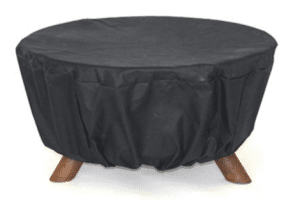 Deck protect fire pad-This pad is designed to protect wood and composite decking from the heat of your fire pit. It will take heat up to 1400 degrees for a extended time. Made in the United States layered with carbon filler and woven with volcanic rock fibers. It comes in five sizes to fit different size fire pits. Ranging in size from 12″ by 12″ to 36′ by 36′. 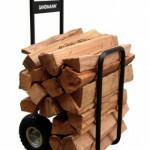 Fire wood storage ideas-Having a storage solution for your firewood to keep it organized and dry is very important. Look at some of these ideas to help you keep your fire wood safe and ready to use. These Collegiate fire pits are guaranteed for five years to not burn or rust through. The fire pit is made from cold rolled steel to make it last a long time with the proper care. 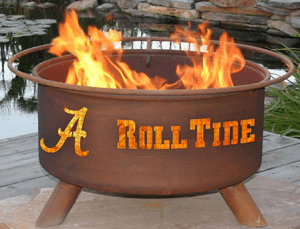 Show your team pride next time you get together with you buddies to have that tailgate party and show off your team with your very own Collegiate Fire Pit. Tell me what your favorite team is and send me pictures of your tailgate party at the game or at home. Any comments or questions use the form below, I will get back to you shortly. There are some affiliate links in this article, if you use one I may make a small commission, it will not effect your purchase price. I love the idea for the site in general, and the college fire pit thing is totally great and original as far as I’ve seen. Plus, the additional talk of all the accessories is great, as well. Will definitely be back to check this site out again in the future. If you follow any team in the fall, this is a great idea or gift. For those who sit at home to watch the big games, you can sit outdoors and party until the big game comes on. If you go to the game you can arrive early and have yourself all set up before you gang arrives.